The civil rights activist who provoked anger, mockery and confusion last year after her white parents revealed she had posed as a black woman for years has unveiled a memoir that claims to explore “the discrimination she’s suffered while living as a black woman”. If being a black woman is so horrible because of all the “discrimination,” why pretend to be one when you are not? Looks like you will have to buy the book to find out. Dolezal announced details of the book on her Instagram account on Monday, saying it will be titled In Full Color: Finding My Place in a Black and White World. An Amazon description of the book says it will explain “the path that led her from being a child of white evangelical parents to an NAACP chapter president and respected educator and activist who identified as black”. The “respected educator” taught victim studies B.S. as an adjunct instructor hired on a quarterly basis by the legendary bastion of higher learning Eastern Washington University, until she was revealed to be a fraud. 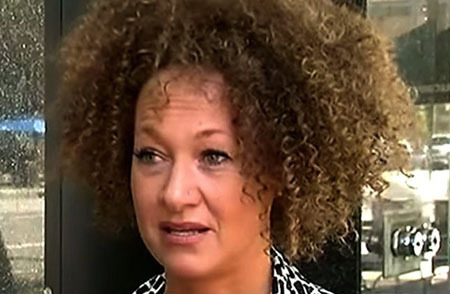 If Bruce Jenner can choose to be a woman, surely Rachel Dolezal can choose to be black, just as you might choose to be a duck-billed platypus. The controversy around Dolezal ballooned when she refused to answer any questions about her race, her adopted brother accused her of practicing “blackface”, and then she insisted that she had deceived no one about her race – and that she is African American. The scary part is that Rachel literally believes herself to be black, not because she imagines her parents to be black, but because “Nothing about whiteness describes who I am.” This makes perfect sense when objective reality has been subordinated to ideology. Rachel self-identifying as Sideshow Bob.